With the speaker of Bosselaar’s poems, we move through dark rooms of grief, finding our way into the light of quiet solitude. who no longer has a shadow. "Laure-Anne Bosselaar's luminous poems mourn the loss of her dear beloved even as they become a testament to the possibility of profound, abiding friendship and love. With compassionate attention, she observes herself in these rooms of life and of grief. Her attention is patient, humble, courageous, and leaves us with a stunningly clear, unadorned trace of a tender history. Inside of her words are windows, darkness and light--a book, a shared life 'alive with its own clarity.' Such texts feel ancient, ongoing. I am forever deepened (taught to listen). Forever moved." "With language both lush and unflinching, Laure-Anne Bosselaar's new collections allows us a long look at what lost love means in the most beautiful and poignant sense of those words. How do we—how can we—make a way through the vast, invisible territory that stretches before each of us when death claims someone for whom our hearts had awakened gloriously and completely? Such grief demands that we feel too much; we find ourselves pressed into a silence that even our closest companions hesitate to engage. 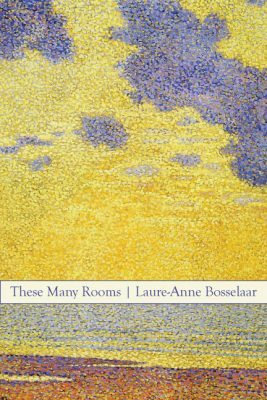 In These Many Rooms, Laure-Anne Bosselaar breaks open this silence, writing frankly and with sublime grace on this difficult walk. As she chronicles life after the sudden passing of her husband, the wonderful poet Kurt Brown, we are offered an intricately detailed map of that half-lit wilderness each person must enter when confronted by overwhelming loss." "These Many Rooms is a sequence of elegies that build to an almost unbearable depth of feeling. They do this not by the rending of clothing or the tearing of hair, but by a subtle, understated study of self as the days and then years pass after the death of a husband. Brimming with grief, the poems alternately shimmer and darken, exploring not only one person's unique experience, but the nature of grieving itself. In language that's simultaneously inventive and plainspoken, Bosselaar charges the ordinary world with the electricity of memory and emotion, so that we feel the missing person's presence everywhere. These Many Rooms is moving, profound, and unforgettable, not the least because it shows us how beauty can be both a solace and a wound. This is a book I'll return to again and again." "...This writer speaks of permanence — then how is it that there’s so much motion and vitality. Doesn’t 'permanent' mean stop? No, here it means replaced with a shining goal...."